Director: Andreas Prochaska / Writers: Thomas Baum, Uli Bree & Andreas Prochaska / Cast: Sabrina Reiter, Julia Rosa Stockl, Michael Steinocher, Nadja Vogel, Laurence Rupp, Julian Sharp, Andreas Kiendl, Karl Fischer, Amelie Jarolim, Susi Stach. About the trillionth offshore Xerox of I Know What You Did Last Summer, this twee Austrian export can boast some stunning scenery and well above average photography, something Euro-horror does better than most. A clique of graduating high schoolers each receive the same text message, which tells them they’ll be dead within three days – hence the title, duh. They assume it’s a prank, most likely by the requisite outcast and party on down. The joy of leaving school is somewhat short lived when one of them disappears and turns up bound and weighted in the town’s lake the next day. The usual reactions ensue: the police blame whomever is convenient; the teens grieve and attacks continue. Dead in 3 Days elects a not-so-obvious final girl in Nina, girlfriend of the recently departed, who is the next to be abducted but escapes from the slicker-clad killer, allowing him/her to move on the next target, beheading them with the help of a splintered fishtank. With the cops now taking notice, the three remaining kids are quizzed about who they think might want them dead and eventually recall an ice-skating accident from their childhood where a school buddy of theirs died and, two days later, his grieving father hanged himself – or did he? Eventually, the kids break curfew and head to the former home of dead-kid and confront the killer. What should now crank up the considerable amount of tension (the circumstances of the past incident not yet fully clear), instead fizzles out in a flat, kinda rushed finale. Nicely done but too generic to be memorable. Dubbed into English with more care than most efforts. A sequel followed in 2008. Blurb-of-interest: As well as the sequel, lead actress Reiter was in One Way Trip 3D a few years later. 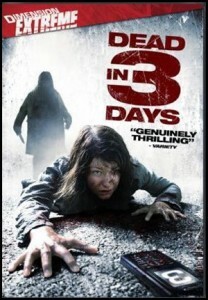 Wonder if the sequel will get a wider DVD release, or if anyone has the audacity to make a film titled Dead in 3 Days 3. If they were to make a third entry into the series one way they could get around the name thing is to make it in 3D and then call it Dead in 3 Days 3D which actually sounds pretty cool. Might be too expensive to make in 3D though I guess.